As we began our fulfillment of the original Aventuria Kickstarter, we discovered that a few people had experienced a packing error either in the base set or in one of the expansions (usually Forest of No Return). They realized that the rivets for their life wheels came in the wrong numbers which resulted in either two male or two female connectors at the end. We replaced all the backers’ rivets, but as we started selling the game at Gen Con we realized that our initial retail release all comes from the same print run, so there are likely to be a few more such packing errors. 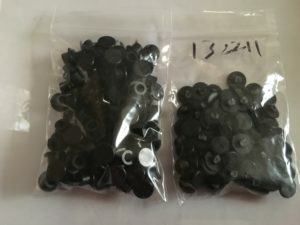 If you bought the game at Gen Con – or if you buy it at stores once it comes out this fall – and you discover that your rivet configurations are not correct, just contact us directly and we will send you replacements from the stock you see above. These rivets are not the same color or external shape, but they are the same size at the center and should work just fine with your life wheels. They do have a slight advantage in that they are flatter, although they are not translucent so they may cover the image a bit more. Thank you, and enjoy the game!